We have been creating and selling virtual goods for more than 10 years. We have built space with you in mind. space is built for commerce - we've put the storefront at the front and center of our user interface; end users can open it with one click from the main UI; search and find any bit of content you choose to list; all without interrupting what they were doing, or where they were. There's no need to visit any external websites, or travel to other regions (unless you want them to) in order to buy your content. 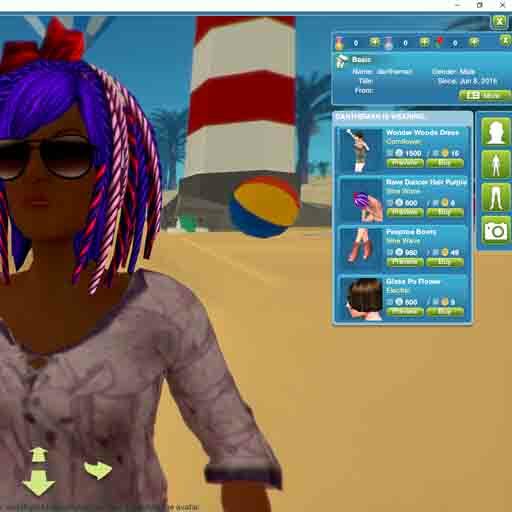 All clothing items can be previewed on the user's own avatar in the store before they purchase. Similar patterns and designs can be grouped together - allowing users to browse the variations on your items easily. You don't need to create custom vending machines or fill a region with posters. Your creations are automatically available for in store preview as soon as you release them. Further, If you do want to put vending machines and posters in your region - you can use our NPC system to dress using your clothing, without hassle. Users can click on each other to effortlessly check out each other's outfits; with immediate links taking them to the store to preview each item someone is wearing. So every customer of yours becomes a live, interactive showcase for your products, bringing other people in touch with your creative work. A customer sitting in a popular location can expose your goods quickly and easily to a large audience.